The Kepler Mission is a NASA space telescope designed to discover Earth-like planets orbiting other stars. 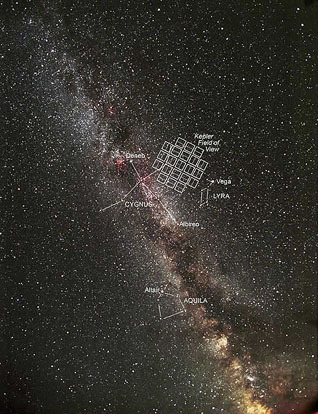 Orbiting the sun for at least 3.5 years, Kepler will use a photometer developed by NASA to continuously monitor the brightness of over 100,000 stars in a fixed field of view. The data collected from these observations will be analyzed to detect periodic fluctuations that indicate the presence of transiting exoplanets. The mission is named in honor of German astronomer Johannes Kepler. 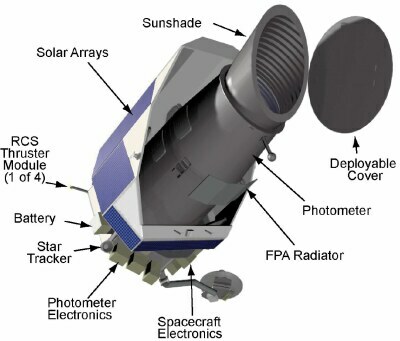 Kepler is a mission under NASA's Discovery Program of low-cost, focused science missions. NASA's Ames Research Center is the home organization of the science principal investigator and is responsible for the ground system development, mission operations and science data analysis. Kepler mission development is managed by NASA's Jet Propulsion Laboratory. Ball Aerospace & Technologies Corp. is responsible for developing the Kepler flight system. The Kepler Spacecraft was launched on March 6, 2009 at 22:49:57 UTC-5. Determine how many earth-sized and larger planets there are in or near the habitable zone (often called "Goldilocks planets") of a wide variety of spectral types of stars. Determine the range of sizes and shapes of the orbits of these planets. Estimate how many planets there are in multiple-star systems. Determine the range of orbit size, brightness, size, mass and density of short-period giant planets. Identify additional members of each discovered planetary system using other techniques. Most of the extrasolar planets detected so far by other projects are giant planets, mostly the size of Jupiter and bigger. Kepler is designed to look for planets 30 to 600 times less massive, closer to the order of Earth's mass. 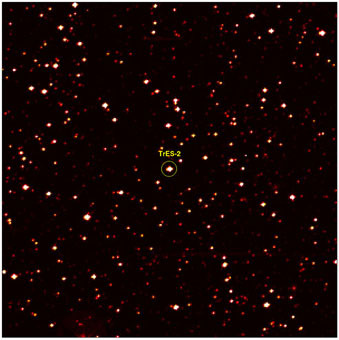 The method used, the transit method, involves observing repeated transit of planets in front of their stars, which causes a slight reduction in the star's apparent magnitude, on the order of 0.01% for an Earth-sized planet. The degree of this reduction in brightness can be used to deduce the mass of the planet, and the interval between transits can be used to deduce the size of the planet's orbit and estimate its temperature. The random probability of a planetary orbit being along the line-of-sight to a star is the diameter of the star divided by the diameter of the orbit. 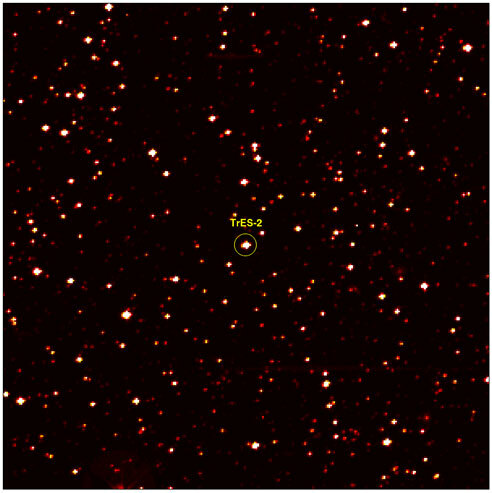 For an Earth-like planet at 1 AU transiting a solar-like star the probability is 0.465%, or about 1 in 215. At 0.72 AU (the orbital distance of Venus) the probability is slightly larger, at 0.65%; such planets would be Earth-like if the host star is a late G-type star such as Tau Ceti. In addition, because planets in a given system tend to orbit in similar planes, the possibility of multiple detections around a single star is actually rather high. For instance, if an alien Kepler-like mission observed Earth transiting the Sun, there is a 12% chance of also seeing Venus transit. The Kepler Mission has a much higher probability of detecting Earth-like planets than the Hubble Space Telescope, since it has a much larger field of view (approximately 10 degrees square), and will be dedicated for detecting planetary transits. The Hubble Space Telescope is, in contrast, used to address a wide range of questions and rarely looks continuously at just one starfield. The Kepler Mission is designed to observe 100,000 stars simultaneously, measuring variations in their brightness every 30 minutes. This provides a better chance for seeing a transit. In addition, the 1-in-215 probability means that if 100% of stars observed had the same diameter as the Sun, and each had one Earth-like terrestrial planet in an orbit identical to that of the Earth, Kepler would find about 465. The mission is well suited to determine the frequency of Earth-like planets orbiting other stars. Since Kepler must see at least three transits to be sure the dimming was caused by a planet, and since larger planets give a signal that is easier to check, scientists expect the first reported results will be larger Jupiter sized planets in tight orbits. These could be reported after only a few months of operation. Smaller planets, and planets further from their sun will take longer, and discovering planets comparable to Earth is expected to take three years or longer. Data from the mission will also be used for studying variable stars of various types and performing asteroseismology, particularly on stars showing solar-like oscillations. 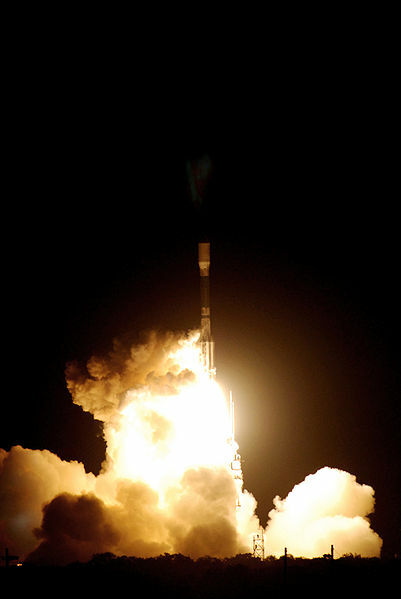 Kepler mission launch, March 6, 2009. In January 2006, the project was delayed eight months because of budget cuts and consolidation at NASA. It was delayed again by four months in March 2006 due to fiscal problems. At this time the high-gain antenna was changed from a gimballed design to one fixed to the frame of the spacecraft to reduce cost and complexity, at the cost of one observation day per month. The observatory was launched on March 7, 2009 at 03:49:57 UTC (March 6, 10:49:57 EST) aboard a Delta II rocket from Cape Canaveral Air Force Station, Florida. The launch was a complete success and all three stages were successfully completed by 04:55 UTC. The cover of the telescope was blown away on April 7, 2009 and the first light images were taken on the next day. On April 20, 2009 it was announced that the Kepler science team had concluded that further refinement of the focus would dramatically increase the scientific return. On April 23, 2009 it was announced that the focus had been successfully optimized by moving the primary mirror 40 microns (1.6 thousandths of an inch) towards the focal plane and tilting the primary mirror 0.0072 degrees. On May 12, 2009 at 5:01 p.m. Pacific Time (17:01 UTC-8) Kepler successfully completed its commissioning phase and began its search for planets around other stars. On June 18, 2009, the spacecraft is expected to send its first science data to Earth, at which point the mission's science team will begin analysis. Kepler Mission search in context of Milky Way galaxy. 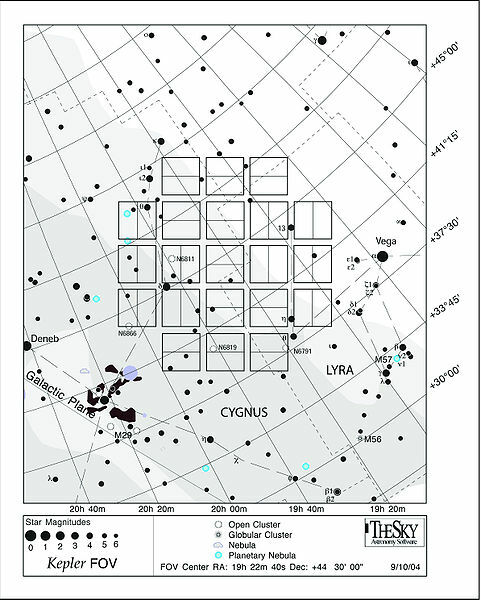 The photometer's field of view in the Cygnus, Lyra and Draco constellations. 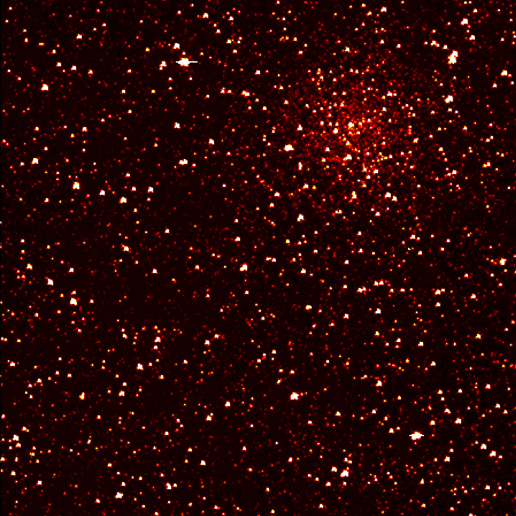 A high resolution photo taken by Kepler on April 8, 2009. Celestial north is to the left. 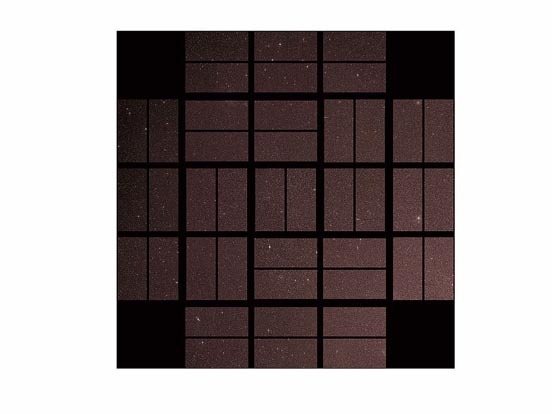 A photo taken by Kepler with two points of interest outlined. Celestial north is to the left. Detail of Kepler's image of the investigated area showing open star cluster NGC 6791. Celestial north is to the left. 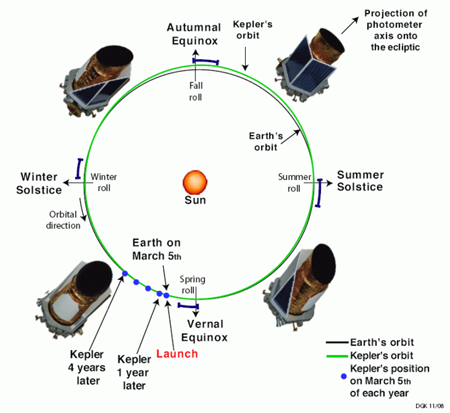 Kepler is not in an Earth orbit but in an Earth-trailing solar orbit so that Earth does not occlude the stars which are observed continuously and the photometer is not influenced by stray light from Earth. This orbit avoids gravitational perturbations and torques inherent in an Earth orbit, allowing for a more stable viewing platform. 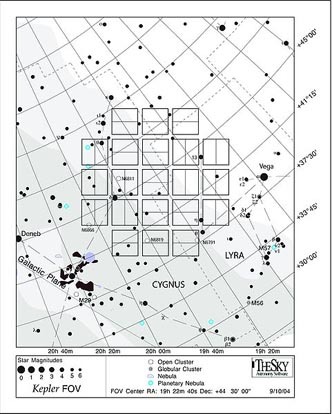 The photometer points to a field in the northern constellations of Cygnus, Lyra and Draco, which is well out of the ecliptic plane, so that sunlight never enters the photometer as the spacecraft orbits the Sun. Cygnus is also a good choice to observe because it will never be obscured by Kuiper belt objects or the asteroid belt. An additional benefit of that choice is that Kepler is pointing in the direction of the Solar System's motion around the center of the galaxy. 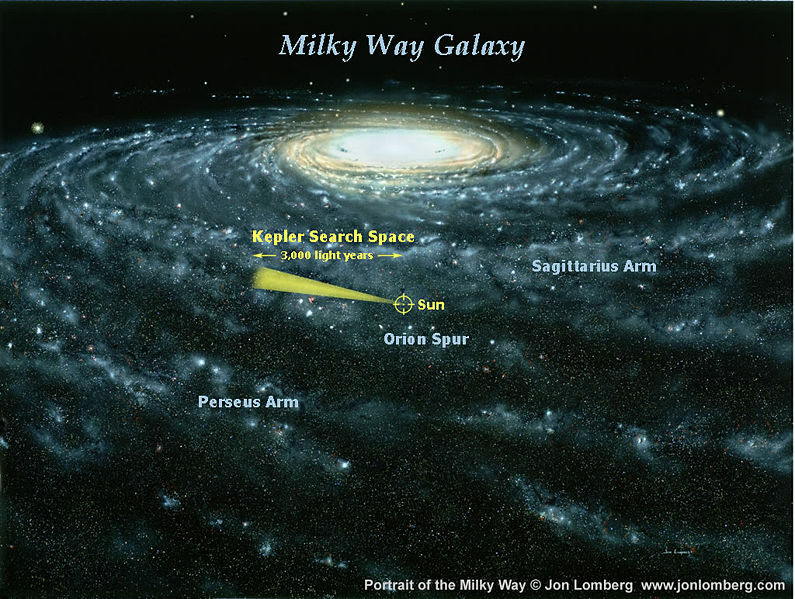 Thus, the stars which are observed by Kepler are roughly the same distance from the galaxy center as the Solar System, and also close to the galactic plane. This fact is important if position in the galaxy is related to habitability, as suggested by the Rare Earth hypothesis. The spacecraft is estimated to have a mass of 1,039 kilograms (2,290 lb), have a 0.95-meter (37.4 in) aperture, and a 1.4-meter (55 in) primary mirror (the largest on any telescope outside of Earth orbit). The spacecraft will also have a 105 deg² (about 12 degree diameter) field of view (FOV) which is equivalent to roughly one fist held at arm's length. The photometer has a soft focus to provide excellent photometry, rather than sharp images. The combined differential photometric precision (CDPP) for a m(V)=12 solar-like star for a 6.5 hour integration will be 20 ppm, including an expected stellar variability of 10 ppm. An earth-like transit produces a brightness change of 84 ppm and lasts for 13 hours when it crosses the center of the star. The focal plane is made up of 42 CCDs at 2200 × 1024 pixels which makes it the largest camera launched into space with a resolution of 95 megapixels. The array is cooled by heat pipes connected to an external radiator. The CCDs are read out every six seconds and co-added on board for 30 minutes. Only the pixels of interest from each of the target stars are stored and telemetered to the ground. The mission's life-cycle cost is estimated at US$600 million, including funding for 3.5 years of operation. The Kepler mission is operated out of Boulder, Colorado, by the Laboratory for Atmospheric and Space Physics (LASP). The solar array will be rotated to face the Sun at the solstices and equinoxes. These rotations will be used to optimize the amount of sunlight falling on the solar array and to keep the heat radiator pointing towards deep space. Together, LASP and Ball Aerospace & Technologies Corp. (who are responsible for building the spacecraft and instrument) control the spacecraft from the mission operations center located on the research campus of the University of Colorado. LASP performs essential mission planning and the initial collection and distribution of the science data. NASA contacts the spacecraft using the X band communication link twice a week for command and status updates. Scientific data is downloaded once a month using the Ka band link at a maximum data transfer rate of 4.33 Mb/s. 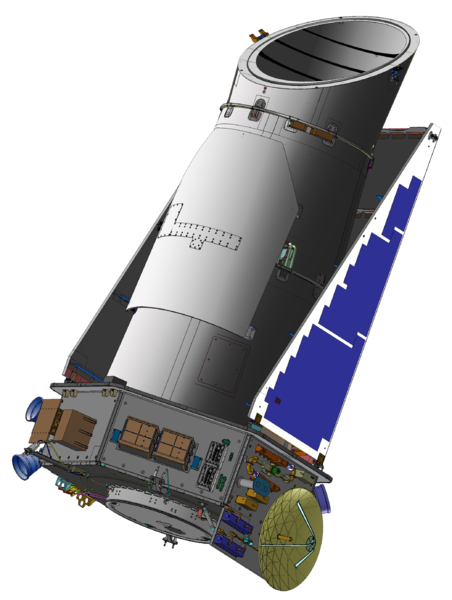 The Kepler spacecraft conducts its own partial analysis on board and only transmits scientific data deemed necessary to the mission in order to conserve bandwidth. Science data telemetry collected during mission operations at LASP is sent on for processing at the Kepler Data Management Center (DMC), located at the Space Telescope Science Institute on the campus of The Johns Hopkins University in Baltimore, Maryland. The science data telemetry is decoded and processed into uncalibrated FITS-format science data products by the DMC, which are then passed along to the Science Operations Center (SOC) at NASA Ames Research Center, for calibration and final processing. The SOC will eventually return calibrated data products and scientific results back to the DMC for long-term archiving, and distribution to astronomers around the world through the Multimission Archive at STScI (MAST). 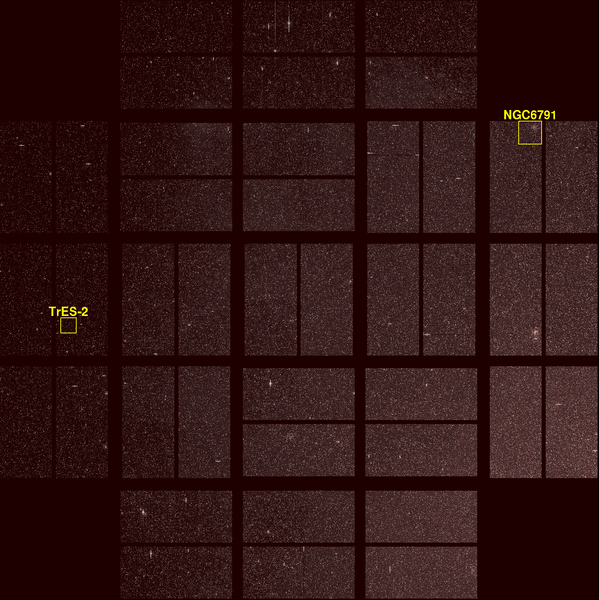 Detail of the Kepler's image of the investigated area. The location of TrES-2b within this image is shown. Celestial north is to the left. The image, shown to the right, is magnified detail from the full field of view image shown above. This image also identifies the TrES-2b system and clearly shows the parent binary star, GSC 03549-02811, in the constellation Draco. Diagram of Kepler's investigated area with celestial coordinates. 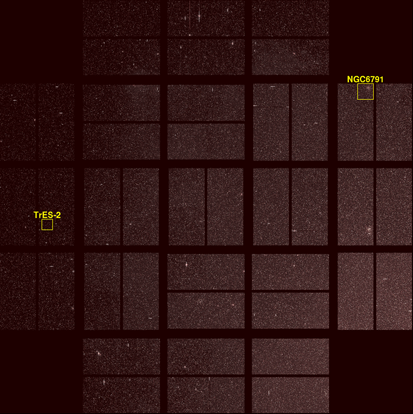 Kepler has a fixed field of view (FOV) against the sky. The diagram to the left shows the celestial coordinates and where the detector fields are located, along with the locations of a few bright stars with celestial north at the top left corner. Click on the diagram to see a detailed view. The mission website has a calculator that will determine if a given object falls in the FOV and if so where it will appear in the photo detector output data stream. Below is a table of known extrasolar planetary systems from the List of extrasolar planets that fall within the FOV of Kepler, ordered by right ascension. Now that Kepler is operational the project expects to quickly confirm the three known transiting exoplanets in Kepler's field of view. COROT is a French space mission, launched in December of 2006, to discover planets by transits. Spitzer Space Telescope is a NASA infrared telescope sometimes used for exoplanet research. MOST is an asteroseismology satellite built by Canada and launched in June of 2003.